If you don’t want your trip to Lisbon to be all about the Eurovision Song Contest, the city has a lot to offer whether you prefer nature or history. We take a closer look at what you could be doing on a day off in Lisbon. We’re a month away from the Eurovision Song Contest 2018. This will be the very first time the show will be held in Lisbon and we’ve been preparing you for what to expect in this year’s Eurovision host city. We previously prepared you for the city’s transportation, guided you to restaurants and even offered you the possibility of getting married in Lisbon. Now, it’s time for some sightseeing. Below we will recommend five of ten of the many things you can do in Lisbon. The remaining five will come in a second part later next week, but don’t for a second think you’re restricted to those. Have fun and explore! Belém is one of the most attractive places for tourists and for many reasons. 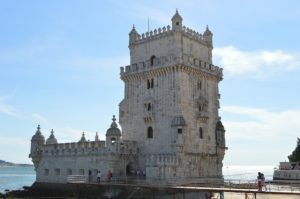 Not only will you find the iconic Torre de Belém, but with less than ten minutes walking, you’ll be able to explore Mosteiro dos Jerónimos (Jerónimos Monastery). If you’re into architecture, you’ll easily fall in love with those two that were both classified as UNESCO World Heritage Sites. If you’re not so much into architecture, midway you’ll find the iconic and delicious Pastéis de Belém… Be ready to queue in. Friendly suggestion? Choose to get inside, sit down and get some rest while you enjoy one or two pastéis. Also remember that Pastéis de Belém is not the only venue you’ll find selling Pastéis de Nata. Portugal is very known for its hot weather and for its beaches. Therefore, don’t miss the opportunity of visiting one of them and, if possible, get in the water and swim in the ocean. You’ve so many to choose from, it’s hard to recommend only a few. Know that Cascais line is filled with many (Carcavelos, Santo Amaro, Praia de São Pedro…) and Sintra as well even though it isn’t as easy to get to them (Praia Grande, Praia das Maçãs, Praia da Ursa…). On the other side of the river, you have even more in Costa da Caparica. There are a lot of them and many have specific themes that we’d recommend checking out. Don’t do it, if it’s night as it may not be as fun. Sintra is one of the most historical places of Portugal and there are so many things to see. Not only we recommend checking out its beautiful downtown, but also visit some of its highlights, especially if you’re into history: Palácio da Pena, Castelo dos Mouros, Quinta da Regaleira, etc. There are so many different and iconic places to visit in the municipality that you may want to spend an entire day there. Don’t forget to try its tasty Queijada de Sintra. Lisbon’s nights are some of the funniest ones. Every Friday and Saturday (mostly), Bairro Alto gets so crowded that sometimes it’s hard to move, but there are so many bars and clubs that you can simply get inside, dance, drink a little and leave whenever you feel like. Many are free, others are paid. Talking about a night out, you don’t have to wait until Friday or Saturday. Don’t forget that Trumps – Lisbon’s biggest gay club – is hosting Eurovision parties and is aiming to be this year’s biggest unofficial EuroClub. The venue is very close to Bairro Alto. Lisbon is certainly a beautiful city that mixes traditional with modern and you have so many spots where you can have an amazing view of it. Some are paid, others are free but all give you different perspectives of the city. The two best examples for this would be the view you have in Miradouro do Jardim do Tourel that is opposed to Miradouro de São Pedro de Alcântara. Both are quite near Rossio, but will require you to walk a little (unless you take an elevator or another mean of transportation). Another great view you can enjoy for free is the one in Marquês de Pombal, one of the most emblematic spots of Lisbon. If you feel like sitting down while enjoying a drink, we recommend Lost In, a restaurant/bar that features a balcony and an amazing view. One other alternative is on the other side of the river, in Cristo Rei. While you have the opportunity of going even higher, the view is already great at the entrance. Finally, there’s obviously Elevador de Santa Justa that goes 45 meters high. Its structure is influenced by the Eifel Tower in Paris, and you can enjoy a beautiful view of the city. Know that the demand is high and many tourists queue in, so be prepared to wait. As mentioned, next week we will be revealing five more things to see or visit in Lisbon, so stay tuned and let us help you build your Lisbon schedule! We’re only a month away. Last year victory, this year last place – how did Portugal receive that?